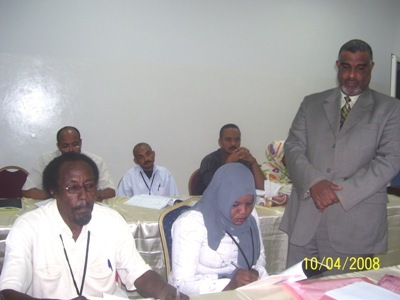 On Thursday 10/4/2008, the course of Leaders' meeting management was completed; it was presented by trainer Abdel Moniem Alomairi at the development and constant training center in Khartoum where NLP techniques were used. It's known that Meeting Management is one of the administrative courses which have no direct connection with NLP. The trainer started the course by telling a symbolic story or anecdote; such stories are a way to tap into unconsciousness, using stream of consciousness, and plant positive values. The story was about the importance of determining objectives through using NLP topics. It also contained some natural sights described by the trainer through moving between acting systems which had immense impact on the trainees. During the course, the trainer took the trainees on two mental voyages. The first one was imaginary (a world without real contact). The trainer, by using NLP, asked the trainees to relax and take deep breath, then to imagine their family environment, Sudan, Africa, the Arab World, then the Globe without meetings. Then some imagined a world full of wars and problems because the International Security Council didn't convene. While some imagined the world in disorder, some others focused on the family and potential problems which might happen in a case of family members didn't meet. All had one conclusion concerning the importance of meetings up. The second one was to Kasab, a very beautiful tourist attraction in the north of Syria, about 50km from Lattakia. This trip was as a break for relaxing, closing the eyes, and describing the area through moving between the acting systems. During the course, a hypothesis of “the map is not the reality" was explained, so the head of the meeting and the participant grasp the mental imagery of each other , respect it and know how to deal with it. The trainer talked about the ant, to set an example, and how it fancies other animals. He also explained the reframing method is to be used in meetings. If someone said “we can't do that" you reply" definitely, we don’t have to do that.’ The difference is so obvious between the tow. The trainer clarified the Sandwich method, used as feedback, in positive criticism. He talked about the characteristics of consciousness and the importance of intensifying the speech in a positive way and using it in meetings. Finally, he concluded the course with addressing unconsciousness by using the overlapping stories. He started narrating a story and in the middle of it he stopped and started narrating a second one then a third one using the same method. After that he gave a brief summary of the course then completed the third story, the second, and finally the first one. He gave obvious hints that learners were great and excellent. He assured them that their distinction will last forever. Then he concluded the course which had great impact on the trainees. Trainee Amel Mohammad Ali: it was a great and useful course at all levels. We'll keep on training, as a way of appreciating our trainer, and in order to achieve success in less time and effort. Trainee Faeza Al-Amin: the participation spirit and the development of new ideas were some of the best things in the course. Trainee Hiba Ja'afer: the trainer has a good knowledge concerning the course content. He was encouraging all for participating. He's skillful and cooperative.